A variety of truly wonderful antifungal herbs are used by herbalists to help treat different ailments. Some of these powerful healing herbs are used internally, while others are taken externally. These natural medicines can be found in many places around North America. Some of them even grow in urban gardens and other heavily developed areas. California Bay (Umbellularia californica) = this native Californian tree is best used externally in tincture or strong tea form as an external antifungal wash.
Beebalm (Monarda didyma) = this showy flower is one of the most amazing herbs, especially externally as a tincture, foot bath, tea or douche (strong tea). Burdock (Arctium Lappa) = this weedy plant is good medicine for many things. 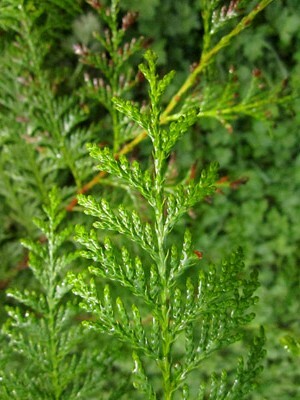 As an antifungal it is best used by drinking it as a tea, making a wash or soak with it as a strong tea, or as douche. The root is the most effective part to use for medicinal purposes. Cinnamon (Cinnamomum zeylanicum) = this well recognized spice has been shown to have strong antifungal properties. Most commonly cinnamon is used as an antifungal in the form of an extract or oil. 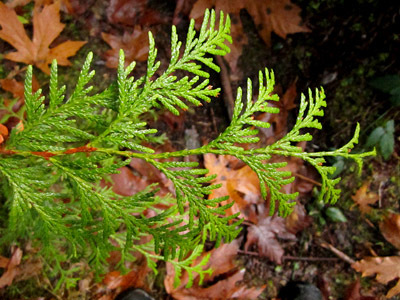 Western Red Cedar (Thuja plicata) = a native tree of the Pacific Northwest that has strongly antifungal and antibacterial qualities. For antifungal properties, it is best used as an alcohol or glycerin tincture applied several times a day. 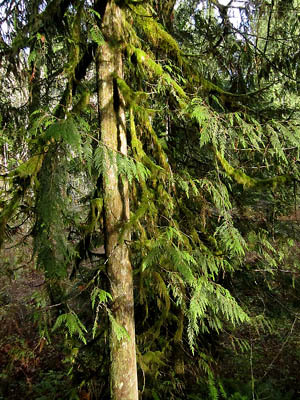 An image of the tree is seen above, and an image of the foliage is visible below. Sweet Root (Osmorhiza occidentalis) = a licorice or anise scented herb, with a strongly medicinal root. 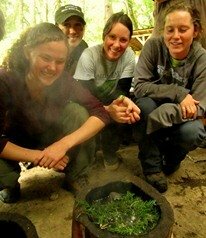 A diluted tincture can be applied externally for antifungal needs or as a decoction useful for yeast infections. The root tea is good for helping with upper-intestinal candidiasis. White Sage (Salvia apiana) = this lovely, strongly aromatic plant is a native of the chaparral habitats of southern California. It can be used as good treatment of acute candidal vaginitis in the form of a sitz bath and a douche. California Soap Plant (Chlorogalum pomeridianum) = this native plant is a great antifungal herb for treating issues with the scalp. It works best when used as a hair wash or shampoo after being thinly sliced or grated, and then agitated in a container until foamy. Pacific Wax Myrtle (Myrica californica) = this coastal shrub works best as an antifungal in tincture form, used externally, especially along with western red cedar tincture. California Mugwort (Artemisia vulgaris) = an aromatic herb related to sagebrush (Artemisia tridentata). It can be made into a antifungal tea for external use. Labrador Tea (Ledum glandulosum) = this moisture loving plant works as an antifungal wash in the form of fresh tincture. Fresh tincture will also kill lice, scabies and chiggers. 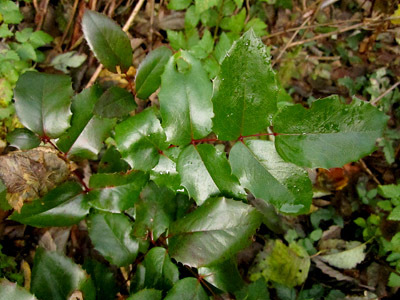 Oregon Grape (Mahonia ssp.) = this waxy, prickly, yellow-flowered shrub has great antimicrobial and antifungal properties for both internal and external uses. The most effective medicinal portion of the plant is the root, and it is best when tinctured. 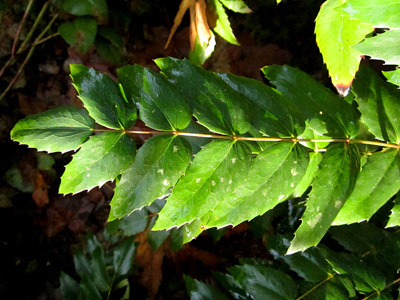 Tall Oregon grape (Mahonia aquifolia) is seen below, while in the photo above is the low Oregon grape (Mahonia nervosa). Both plants are equally powerful healing herbs. It can be used as a replacement for Golden Seal (Hydrastis canadensis) which is a seriously over-harvested, rare medicinal herb. Oxeye Daisy (Chrysanthemum leucanthemum) = this common road-side and pasture weed is a useful plant in the form of a strong tea as an antifungal wash.
Usnea Lichen (Usnea sp.) = this often overlooked organism is a combination of plant and fungal cells. It is an amazing immune-supportive medicine, and is best used internally and externally in tinctured form. Please contact you doctor, herbalist or naturopath on whether using any of these antifungal herbs is right for you, and ask them about proper doses for your particular needs. Everyone has a unique body that responds differently to each herb.